It’s good news for many homeowners who want to cut down their energy costs. 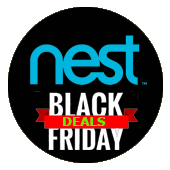 Black Friday smart thermostat deals have started trickling in. 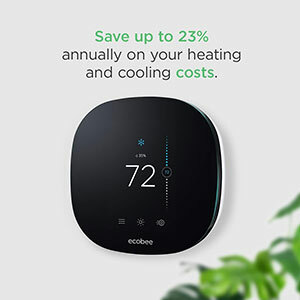 At Robotbox, we endeavor to help you get all the best deals in one place so if you are shopping for a thermostat, make sure to bookmark this page. 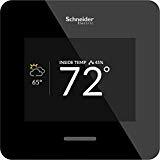 We will be hunting all the best Wi-Fi thermostat deals for Black Friday, listing all of them here. But just before that, a short introduction to the sale. What’s The Fuss About Black Friday? 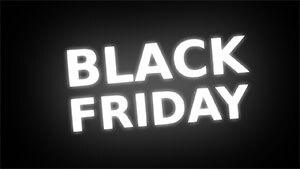 The term Black Friday originated in Philadelphia and was coined from the chaotic events that were witnessed on the day after Thanksgiving. There was a shopping frenzy with huge crowds of people in the streets and heavy traffic that often led to accidents. The recent shopping stampedes we have also witnessed is enough for the day to be called Black Friday. 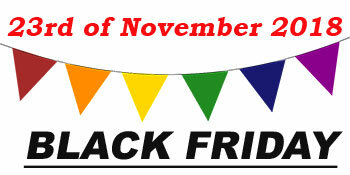 Black Friday is the biggest shopping event in the whole world and marks the start of the shopping season. For many sellers, it’s a time to offload the dead stock and restock for the Christmas shopping season. This explains why you will find some of the craziest discounts during the event. The 2018 Black Friday will be held on the 23rd of November 2018. However, expect some early deals as early as 20th. The deals will also extend to the following in another tech sale called Cyber Monday where smart gadgets are also in plenty. 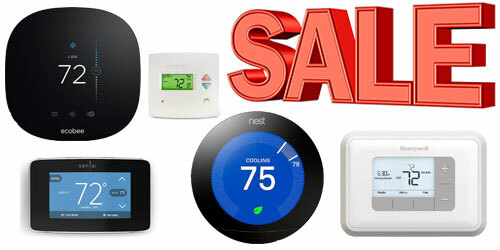 The Wi-Fi thermostats market has witnessed some of the biggest discounts. In the 2017 Black Friday smart thermostat deals, we saw discounts ranging from 20% all the way to 50%. This year, we expect to have the craziest discounts ever. Already, we’ve seen a few brands teasing us with slashed prices severally. Also, the fact that we have some new cheap brands and the latest models will surely make the competition stiffer, and that means more discounts. Here are all the smart thermostat Black Fridays deals. 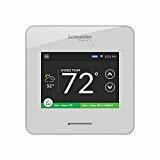 Now that you know some of the prime smart thermostat deals that will feature in the 2018 Black Friday, it’s time to juggle up our minds a little bit regarding the selection of an intelligent thermostat. Let’s start by understanding what a Wi-Fi thermostat is and how it works. 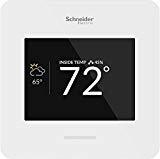 As the name suggests, a connected thermostat is a device that works just like the regular thermostat but can connect with other connected devices like Smartphones, Alexa, intelligent hubs, and others. The integration enables homeowners to control their HVAC systems remotely, easily and more accurately. Basically, WiFi thermostats offer the convenience of any other connected gadget or device. Why buy a Wi-Fi thermostat? 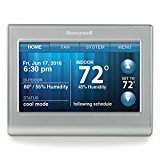 Why buy a new thermostat yet the one installed is just working fine? Well, this sounds like a cracker now that a good smart thermostat should cost you an average of $200 – $300 excluding the installation costs if you may need professional service. 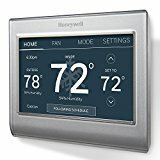 Well, a connected thermostat is a huge investment considering the one-off price and maybe installation cost. However, if you look at the savings from a long-term perspective, installing a smart thermostat is a worthy undertaking. Typically, a Wi-Fi thermostat should cut your monthly bills by 20 – 25%. When you calculate the amount this savings represent, you should be able to recoup your money in a year or two. Isn’t that a clever idea? 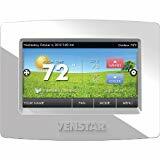 Besides the energy savings, intelligent thermostats offer a lot of conveniences. You can easily and accurately adjust the temperature settings of your home remotely. Some allow you to monitor the temperature of separate rooms and change the settings accordingly from one place without, moving around. If you forget to turn off the heater when leaving for work, no need to turn back; put it off right from your smartphone. Advanced models like Nest Learning adapt to your preferred settings, and in a week’s time, the thermostat will; be adjusting itself automatically. What makes a good WiFi thermostat? You must be wondering, what makes a good smart thermostat? Well, here are some of the features that you should expect from these new systems. The primary reason you are buying a smart thermostat is to cut down energy costs. Smart thermostats record varying savings depending on the model’s capability. That said, make sure to go for the models with the highest savings. But don’t trust anything these brands promise you, read smart thermostat reviews and comparisons to make an informed choice. Also, don’t let the extras fool you. These cheap brands offer very enticing extras that make you forget about the savings. An ideal thermostat should first have an appealing design. The shape, finish, and material should all complement your interior. The display should be large and clear to enable you to notice everything from afar. The new Nest E is one model that scores poorly here as it has a plastic ring and a cloudy display compared to Nest Learning 3 that has a metal ring around it and a clear display. If possible, get one with motion sensors so that the display lights up when you come near it. A good thermostat should automate your HVAC system. One of the best innovations right now is intelligent learning, a feature that enables Nest Learning to master your daily routine and in no time, it takes over the HVAC management. You also want a thermostat that can automatically switch over from cooling to heating especially if you are in places where nights are colder. Another feature is weather-responsiveness that automatically adjusts the HVAC system depending on the weather changes. Geofencing is also a desirable feature that enables the smart thermostats to track your location and adjust the settings so that you may come home to a comfortable atmosphere. When you leave, it adjusts accordingly thus saving you money. We also have remote sensors that enable homeowners to manage homes with more than one level as well as specific rooms that require precise settings, for example, the baby’s room. Integration is also an important aspect, and here, you want a thermostat that can work with the app, voice assistants like Alexa, Siri and Google Assistant and smart hubs like SmartThings and Wink. The integration gives you more control over your thermostat. Apps allow us to manage the HVAC remotely as well as for notifications. Black Friday prices are very enticing, and often, they send us into a dive of impulse buying. One of the mistakes you can make is falling for a cheap Wi-Fi thermostat that doesn’t fit your needs. In this section, we want to take you through the important factors to consider when buying a smart thermostat. The smart thermostat industry has witnessed dramatic growth, attracting some top brands including Google as well as a chain of cheap brands that are hardly known. When buying, we advise that you stick to the household brands; Nest, Honeywell, Hive, Ecobee, and the likes. Even though they are expensive, they offer excellent value for money. There are different types of smart thermostats designed to work with specific systems. That said, make sure your preferred deal works with your systems. 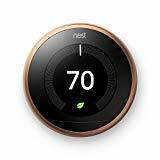 Nest Learning is an excellent deal as it is compatible with several systems including gas, oil, heat pump, hot water, forced air, and so on. 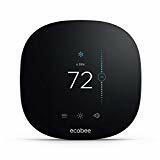 Ecobee also covers wide options, but Honeywell noticeably lacks as it only works with heat pumps. Many homes have a multi-stage heating system which means there is more than one heating level. 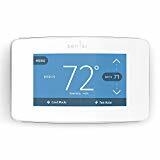 Wi-Fi thermostats have specific requirements so don’t just fall for any thermostat because it’s cheap, ascertain the heat stage functions it supports. For example, if your home has a two-stage heating system, Nest Thermostat E won’t work, but Nest Learning is compatible with both two-stage and three-stage systems. For large homes with separate HVAC systems, you will need one thermostat for each system. While old thermostats worked just fine with the old wiring system, the new models, especially the smart versions require a C-Wire (common wire) that supplies power to features like the display and intelligent connectivity. When buying a smart thermostat, you should check whether it requires a C-Wire or not. A good intelligent thermostat should have a C-Wire, and even though some models may run without it, HVAC specialists don’t recommend using them without it. If you end up with one that doesn’t have a common wire, there are a few workarounds including having it professionally installed or buying adapters and extensions that do the work of the C-Wire. Installing the thermostat should be a straightforward DIY undertaking if you pick these popular brands. If you are buying a smart thermostat on a budget, you don’t want the extra costs of calling a professional to come and install it. That said, it’s really important that you buy a model that is easy to install. Take a photo of your old connection and use it to connect the new wires. However, if this sounds like rocket science, just bear the cost of a professional installer. 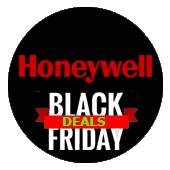 The first question you may want to ask is, where do you get the best Black Friday smart thermostat deals? Well, my advice is to shop online as that’s where you get a variety of options to choose. The few online stores that may have smart thermostats may not have many brands to choose from. Online shopping also gives you the best prices because of the competition that the brands are in. Amazon is among the best places to get the best smart thermostat deals. Now, while offline shopping’s main disadvantage is that you don’t have to scramble for deals physically, they don’t last for long. This is because everyone else is waiting for the same deals and they are definitely limited. One hack is to always stay on the loop when there is a considerable price drop. Our price drop alert will notify you when the prices are at the lowest so make sure to subscribe. Another important thing to do is to look around for some probable deals, and that’s why we have this review of the latest Black Friday smart thermostat deals to keep you on the loop. 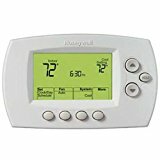 Read reviews and compare the different models available and finally, have a shortlist of the thermostats on your radar. 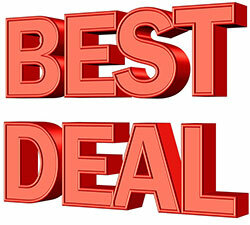 Amazon Prime is another platform that can give you access to some exclusive deals and services. Though it is a paid service, you can access the free trial to see if you like the experience. Flash sales are also a good place to look for smart thermostats. Unfortunately, it’s hard to snap these top brands as they are always limited. The little-known brands are the ones that dominate flash sales with over 50% discounts. When shopping, make sure you have a reliable internet connection. Log into your account and always have the shipping and billing address updated. The idea is to check out fast and not just adding the product to your cart. Also, remember to read the terms and conditions of the different sales to avoid any inconveniences. When your target deals are sold out, don’t be quick to settle for the second option, sometimes the stock is updated. There you have it, folks, all the upcoming Black Friday Wi-Fi thermostat deals. While price and discounts are the order of the day, make sure you get a smart thermostat that fits your needs. Don’t just fall for any other type because it has the biggest discount. Also read: What are the best Black Friday 2018 robot vacuum deals? That said, we’ve come to the end of our review of the best smart thermostat deals in the upcoming sale. What’s your favorite model? Subscribe to our price drop alerts, and we’ll let you know when it’s the right time to buy it. What is the Best Vacuum for Shag Carpet? Bissell Crosswave vs Hoover FloorMate vs Karcher FC5 - What's The Best Vacuum for HardWood Floors?